Your support of Racing the Sun is imperative to engaging our youth and preparing them to enter the workforce. 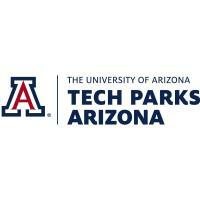 Growing a skilled workforce is key to expanding Arizona's economy. This year we have 12 schools with 17 go-karts from across Arizona including Rio Rico, Sierra Vista, Tucson and Phoenix that will compete for the grand championship as part of the Racing the Sun program! 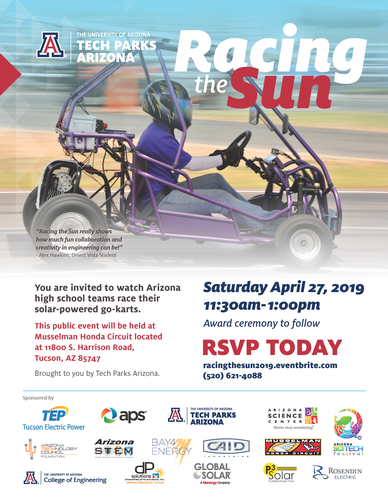 Come watch live solar go-kart racing and see why so many teachers and students are excited about Racing the Sun and meet some of the exceptional students and teachers participating in the program. An awards ceremony will follow the main event. Racing the Sun is sponsored by Tech Parks Arizona, Tucson Electric Power, Arizona Public Service, The University of Arizona College of Engineering, Global Solar, Bay 4 Energy, P3Solar, The Arizona SciTech Festival, The Arizona Technology Council Foundation, ArizonaSTEM, The Arizona Science Center, CAID, Musselman Honda Circuit, Rosendin Electric and Diversified Print Solutions. We look forward to seeing you at the track!